We will never forget. It’s the words we use on this day, eleven years later, we still remember. I was driving to work this morning, listening to the radio. Hearing the stories of survivors, listening to the names of the victims being read, and praying for all the victim’s families. It was on 9/11, the day that changed us. The day that evil penetrated our lives and deeply impacted how we live today. I remember where I was when I saw the planes go into the twin towers. I watched the television like millions of people around the world. As I drove into work this morning listening and praying, I saw a plane go across the sky. Today the planes flew to their destinations and they arrived safely. Because of increased security and awareness, the passengers on those planes flew safely across the skies. And I’m sure every one of those passengers had the same thoughts on their minds. Today is 9/11, a day we’ll never forget. As I drove along the highway towards my destination, I saw that plane at the same time, my heart was crying out to almighty God. Asking for protection, asking for peace, and asking God to embrace those families that lost so much. It wasn’t coincidence when, as I looked at that plane and then I glanced down to my clock radio. It read 9:11. No, it wasn’t coincidence. It was God’s message of remembrance. I don’t know why this tragedy happened 11 years ago. I don’t know why God would allow it to occur. But I do know one thing for sure, our God is a loving God. When tragedy strikes, we draw near to Him. For God never leaves us, He waits for us, to return. He never changes, but we do. On this day, we will not forget. On this day, we remember the heroes that died. We cherish our families, our friends, and our security. Eleven years ago, everything changed. Today we remember. That picture is AMAZING…Thanks for sharing! 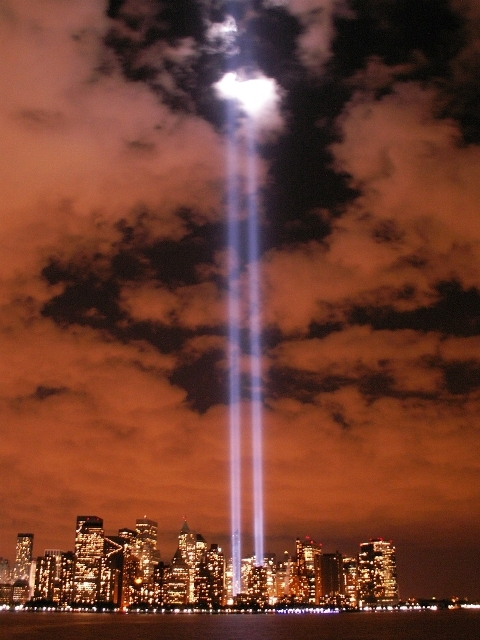 Thank you for linking to my tribute of 911. It is a day that I will never forget. I don’t believe it was a coincidence that a Memorial site was mentioned on the radio that was just 3 minutes away, 3 minutes before the moment of silence. May God bless you and your loved ones.